A macromolecule is a very large molecule commonly created by some form of polymerization. In biochemistry, the term is applied to the four conventional biopolymers (nucleic acids, proteins, carbohydrates, and lipids), as well as non-polymeric molecules with large molecular mass such as macrocycles. The constituent molecules from which macromolecules are assembled are called monomers (mono=single, meros=part). 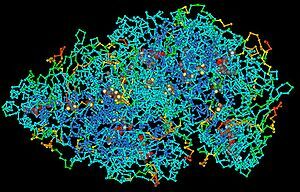 The term macromolecule was coined by Nobel laureate Hermann Staudinger in the 1920s, although his first relevant publication on this field only mentions high molecular compounds (in excess of 1,000 atoms). . At that time the phrase polymer as introduced by Berzelius in 1833 had a different meaning from that of today: it simply was another form of isomerism for example with benzene and acetylene and had little to do with size. Usage of the term to describe large molecules varies among the disciplines. For example, while biology refers to macromolecules as the four large molecules comprising living things, in chemistry, the term may refer to aggregates of two or more macromolecules held together by intermolecular forces rather than covalent bonds but which do not readily dissociate. According to the standard IUPAC definition, the term macromolecule as used in polymer science refers only to a single molecule. For example,a single polymeric molecule is appropriately described as a "macromolecule" or "polymer molecule" rather than a "polymer", which suggests a substance composed of macromolecules. Structure of a polyphenylene dendrimer macromolecule reported by MÃ¼llen, et al. Because of their size, macromolecules are not conveniently described in terms of stoichiometry alone. The structure of simple macromolecules, such as homopolymers, may be described in terms of the individual monomer subunit and total molecular mass. Complicated biomacromolecules, on the other hand, require multi-faceted structural description such as the hierarchy of structures used to describe proteins. Substances that are composed of macromolecules often have unusual physical properties. Although too small to see, individual pieces of DNA in solution can be broken in two simply by sectioning the solution through an ordinary straw. This is not true of smaller molecules. The 1964 edition of Linus Pauling's College Chemistry asserted that DNA in nature is never longer than about 5,000 base pairs. They made this mistake because biochemists were inadvertently and consistently breaking their samples into pieces. In fact, the DNA of chromosomes can be hundreds of millions of base pairs long. Another common macromolecular property that does not characterize smaller molecules is the need for assistance in dissolving into solution. Many require salts or particular ions to dissolve in water. Proteins will denature if the solute concentration of their solution is too high or too low. High concentrations of macromolecules in a solution can alter the rates and equilibrium constants of the reactions of other macromolecules, through an effect known as macromolecular crowding. This comes from macromolecules excluding other molecules from a large part of the volume of the solution, thereby increasing these molecules' effective concentration. Some examples of organic macromolecules are bio-polymers (carbohydrates, proteins and lipids) and synthetic polymers (plastics, synthetic fiber and rubber). Some examples of inorganic macromolecules are diamond, graphite and sand. They are also called giant molecules. ^ Staudinger, H.; Fritschi, J. Ãœber die Hydrierung des Kautschuks und Ã¼ber seine Konstitution. Helv. Chim. Acta 1922, 5, 785'806. ^ Jensen, William B. (2008). "The Origin of the Polymer Concept". Journal of Chemical Education 85: 624. doi:10.1021/ed085p624. ^ Jenkins, A. D. et al. (1996). "Glossary of Basic Terms in Polymer Science". Pure and Applied Chemistry 68: 2287. http://www.iupac.org/reports/1996/6812jenkins/6812basicterms.pdf. ^ Roland E. Bauer, Volker Enkelmann, Uwe M. Wiesler, Alexander J. Berresheim, Klaus MÃ¼llen (2002). 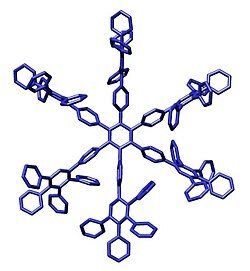 "Single-Crystal Structures of Polyphenylene Dendrimers". Chemistry: A European Journal 8: 3858. doi:10.1002/1521-3765(20020902)8:17<3858::AID-CHEM3858>3.0.CO;2-5. ^ Minton AP (July 2006). "How can biochemical reactions within cells differ from those in test tubes?". J. Cell. Sci. 119 (Pt 14): 2863'9. doi:10.1242/jcs.03063. PMID 16825427. http://jcs.biologists.org/cgi/content/full/119/14/2863. Giant Molecules! by Ulysses Magee, ISSA Review Winter 2002-2003, ISSN 1540-9864. Cached HTML version of a missing PDF file. Retrieved March 10, 2010. The article is based on the book, Inventing Polymer Science: Staudinger, Carothers, and the Emergence of Macromolecular Chemistry by Yasu Furukawa.